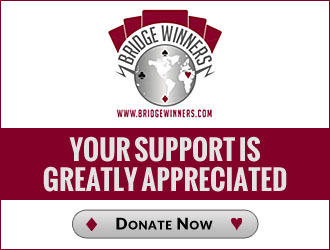 I began my bridge playing life as Jane Knapp, playing in Memphis, TN, Nashville, TN, and Summit, NJ. In the mid-seventies, my husband Bill Eason and I played tourneys in New York and New Jersey. And we enjoyed home games and strong team games with our best friends, Bob and Linda Sartorious, plus many other wonderful bridge-playing friends in the area. On any given night, our 2-table home team games included several national champions. And we never missed the New Jersey Double K. O. 's at Essex Bridge Center, where, teamed up with the Sartorii, we played long matches against some of the strongest players in the area. Besides Bob and Linda, our favorite team mates were John Rengstorff and Billy Erickson. During a 20-year absence from F2F duplicate, I played on the Microsoft Zone as jobanjo. And I currently play with bots on BBO as MawJ. My bridge jobs include directing club games in Summit, NJ and Memphis, TN, off and on for 50 years, and proof-reading a couple of World Champion Books and one Bridge Encyclopedia, under the direction of editor Henry Francis. Bill and I currently live on a farm in north MS, near Memphis and the ACBL, where we have a dog, a cat, two horses and a mule. Other hobbies include genealogy, online word games, driving my mule, horseback riding, and dining out with long-time friends, the Oshlags. Do You Have Any Fun/Funny Lesson Hands for Intermediates? Jim Munday Wins Another BBO Individual Practice Session! Is there UI in this situation? And, if there is no UI, is the tempo relevant? How Would You Rule on This Claim? How Does 1NT Opener Rebid on This Sequence?